When you ask most gardeners what they are excited about growing, you won’t typically hear the answer “community.” For Mark Kearney and Ellen Wert, however, that’s what their work at the Old Tennis Court Farm is all about. As the name suggests, the farm sits on a plot of land where the Germantown Friends School (GFS) built tennis courts in 1908. GFS relocated their athletic facilities around 1980, leaving the .65-acre area to lie dormant. Like most vacant parcels in Philadelphia, the site soon began to attract dumping and other unwanted activity. In 2005, Mark and Ellen got involved with the space through their leadership positions with the Friends of Cloverly Park. The following year, Robert Smith, now one of the lead gardeners at Old Tennis Court Farm, suggested converting the abandoned land into a community garden. 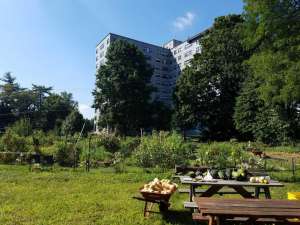 Over the next decade, community members and volunteers, many connected with the Germantown Friends Meeting, worked relentlessly to clear trash and debris, build raised beds, and construct a solar and gravity powered irrigation system. Over 40 community gardeners worked together to grow and donate thousands of pounds of organic produce to local food security organizations. After about ten years of happy and consistent gardening, GFS decided to put the garden up for sale and asked the gardeners to vacate. Ellen, Mark, and other Germantown residents launched into action with hopes of protecting the garden. In the Fall of 2015, Mark and Ellen reached out to several organizations for help. The pair brought together a meeting with NGT, Natural Lands, GFS, and Old Tennis Court Farm gardeners to figure out a pathway to save the garden. After a tense period of negotiation and advocacy from the community to save the garden, the parties agreed on a plan of action. GFS would hold off on selling the property. Natural Lands and NGT would work together to apply for a grant from the Pennsylvania Department of Community and Economic Development (PA DCED) to purchase the property for permanent preservation. Mark and Ellen got busy and in 28 days they collected letters of support from elected officials, wrote sections of the grant proposal, and kicked off a fundraising campaign under the fiscal sponsorship of Germantown United Community Development Corporation which raised $40,000. Obviously, they couldn’t do all this work alone and fortunately, they didn’t have to. 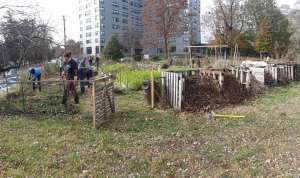 Community members eagerly lent their expertise and resources, enabling Mark and Ellen to pull off the herculean effort required to save the garden. On May 18, 2018, with support from PA-DCED and countless supporters, Natural Lands was able to purchase the property from GFS. In December, Natural Lands officially deeded the Old Tennis Court Farm to NGT, which will hold and support the garden in perpetuity. The sense of doom that Ellen and Mark felt hovering over the garden for the past couple of years has officially been lifted. Once again the OTCF is growing community and healthy food with peace of mind that what they do today will have a lasting impact on the neighborhood.